Amalthea is a figure in Greek mythology who appears during the story of the childhood of Zeus, for Amalthea was one of the carers of Zeus upon Crete, although whether Amalthea was a nymph or a she-goat is an oft debated point. The Titan lord Cronus was fearful of being overthrown by his own child, and so each time Rhea, his wife gave birth, he would swallow the baby, imprisoning it within his stomach. Five children, Hera, Hestia, Demeter, Poseidon and Hades, were thus imprisoned, but when a sixth child, Zeus was born, Rhea conspired with Gaia to have him spirited away to Crete. Cronus was subsequently tricked into swallowing a stone in the place of Zeus. Zeus was hidden away upon Mount Ida, in the Idaean Cave, or upon Mount Dicte, in the Dictaean Cave, but Rhea could not stay with her son, and so care was given over to Adrasteia, Ida and Amalthea. Adrasteia and Ide were nymph daughters of Melisseus, the leader of the rustic gods known as the Curetes, but whether Amalthea was a third nymph or a goat owned by Adrasteia and Ide, is open to interpretation. If Amalthea is a nymph then she is sometimes regarded as an Oceanid nymph, thus a daughter of Oceanus and Tethys, or alternatively, Amalthea is thought to be sister of Adrasteia and Ide, and therefore a daughter of Melisseus. In some texts another nymph, Adamanthea, is spoken of, although it is generally assumed that this is just a different name for Amalthea. In the Fabulae it was Amalthea who hung the cradle of Zeus from a tree, so that it was neither part of the sky, nor touching the ground, so that Cronus would not be aware of it. This would have proven a difficult task for a goat, but equally many ancient sources do tell of Amalthea being the name of the she-goat. The hiding of Zeus was also aided by Melisseus and the other Curetes, for they would dance in their armour, drumming as they did so, hiding the sounds of the new-born Zeus. 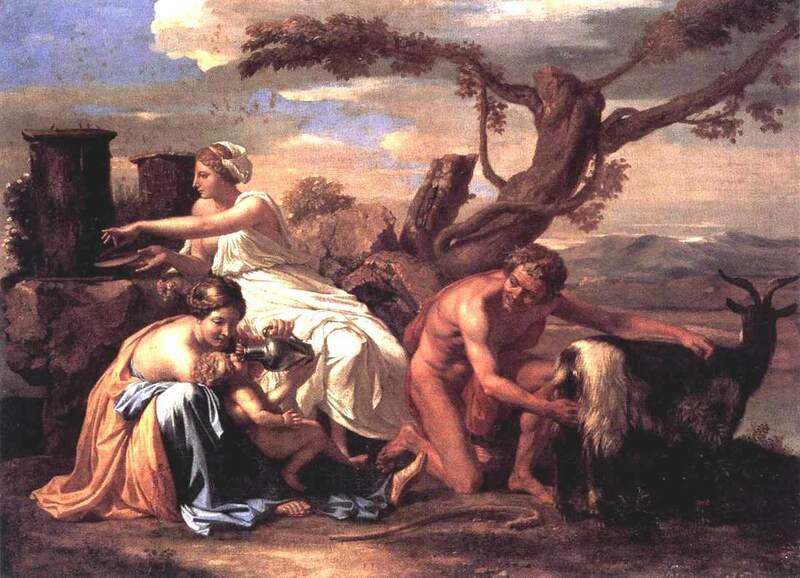 The goat, be it Amalthea, or one owned by Amalthea, would suckle the baby Zeus, providing nourishment, and allowing him to grow. The feeding of Zeus though, was not without its dangers, for it was said that at one time, when Zeus was suckling on the goat he broke off one of the goat’s horns. This horn was later imbued with magical properties, providing it with whatever the owner wished for, and this horn was then known as the Horn of Plenty, or the Cornucopia. There were though alternate origin stories in Greek mythology for the Cornucopia. As a goat, Amalthea is also sometimes associated with the Aegis of Zeus, the shield used by the god to protect him, for the god made use of the hide of the goat after it died. Others claim though that the shield of Zeus came from the skin of the Gorgon Aix, a monstrous creature killed by Zeus at the start of the Titanomachy. Likewise it also said by differing ancient sources that Amalthea, as a goat, was placed by Zeus amongst the stars as the constellation Capra, but again Capra is also said to be the representation of the Gorgon Aix, or Aix, the wife of the god Pan.